It doesn’t take a brain surgeon to realize you’ve got to be extra careful when it comes to shaving your head. It takes a certain type of man to actively introduce a sharp blade to the area of his body that makes his most important decisions such as ranch or honey mustard; WWE or MMA; or Daenerys or Cersei. (trick question, the correct answer is Margaery Tyrell). Surveys have shown that men with shaved heads appear stronger than the average man by 13%. They also appear taller and to have more leadership qualities. It’s also been shown that men wearing hairpieces or men who have thinning hair are thought of the least in these types of survey, suggesting if you’re going to bald already, just take the plunge and get head naked! Important decisions also include how you’re going to best shave that melon of yours, and if you’re looking to do it as safely and smoothly as possible, your best bet is an electric head shaver. But which shaver to buy, because there’s no shortage of them on the market as the bald head look has taken off in our culture over the past 15 years or so. Here’s a deeper dive into seven of the top electric head shavers currently on the market as well as some tips and tricks on how to use an electric head shaver. I’ll be real honest, when I saw this shaver for the first time, I had no idea what I was looking at. Upon second glance, it’s really cool. It looks very much like the talon of an eagle grasping the ground and that’s about as cool as you’re going to get for something you use to remove hair from your body. The Bald Eagle has five rotary cutters that offer a very fast, very close shave, which is great when you’re shaving your head; fatigue is not your friend and mistakes can be painful or ugly or both. Those talons are patented to reach extra long to the back of your head, which can be one of the most difficult spots to reach for any man. It has a horizontal handle design which lets you maneuver it almost anywhere and it works just as well on a wet shave as it does a dry one. Each of the five heads can individually pivot so it glides over your head like a moon rover, taking into account every contour it encounters. All of that and it weighs just 1.3 pounds. The battery charge is good for 90 minutes but you have to plug it in after use, and it takes a full 150 minutes to restore to full charge. Fifty-four percent of Amazon users give it a 5-star rating and it retails for around $120. Talk about a lot of bang for your buck; you’re getting 13 pieces here for $59.99 and it’s ranked as Amazon’s #1 hair cutting kit. You start off employing the hair cut clipper which is small enough to fit in the palm of your hand with a rubberized grip to make sure it stays in the palm of your hand. You can use this to drop the length of your hair down to about one-quarter of an inch in anticipation of shaving yourself bald. The blade is both extra wide and curved so that it will bend where you head bends, making it very effective on the top of your head, behind your ears, and anywhere else where you still have a little Cro-Magnon action going on. Its lithium power battery can give you 40 minutes of use without ever plugging it in, and you can clean it off under tap water without fear of electrocuting yourself. It has nine different length components as well as a brush and oil for cleaning it. Very solid overall piece that averages 4.5 out of 5 stars on Amazon and gets a 5-star rating from 71% of users. What’s in a name? This one has been known to turn a few customers off. Not only are you shoving “5-Star” in there, which I treat about as seriously as hearing something is “World Famous”. And dude, don’t put “Balding” in the name! It’s like the Jerry Seinfeld joke about why doctors call a nose job a Rhinoplasty, haven’t those people been through enough? The unflattering name aside, this is a commercial grade product, so at the outset we’re talking about performance and durability, which is exactly what you want in a product you’re going to be used to shave your head. All that power fits into a 9.6-ounce body. Its earned a 4.3 out of 5 rating on Amazon with 70% of reviewers giving it that coveted 5-star rating. It costs between $70-75. Well that name doesn’t exactly roll of the tongue, but at least it’s not reminding you that you’re balding. 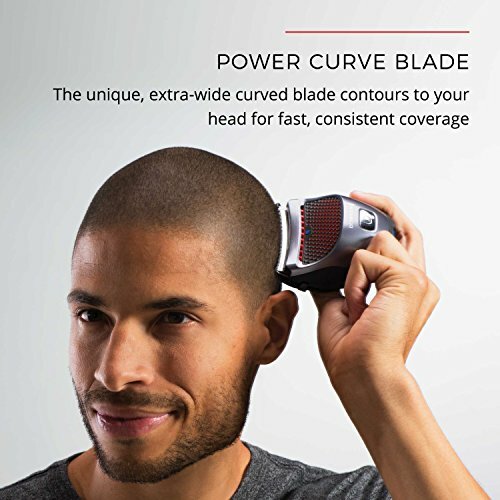 This shaver is built specifically for keeping your head shaved. That’s hair that is under 0.1-0.2 inches in length, which equates to 3-5 days of growth from a bald head. TurnRaise is big about cleanliness and promotes that this model is 100% rash-free and allergic-free. Those kind of claims are hard to back up. We had a minivan once with automatic push-button sliding doors. When I asked the salesman what happened when they stopped working, I was told that it was impossible that this could happen. Impossible happened two years later. The TurnRaise product has an impressive bit of technology in the mix in the form of a micro power chip that has the sole task of keeping the motor’s RPM level constant so your shave is smooth and consistent even when you’re on low battery power. 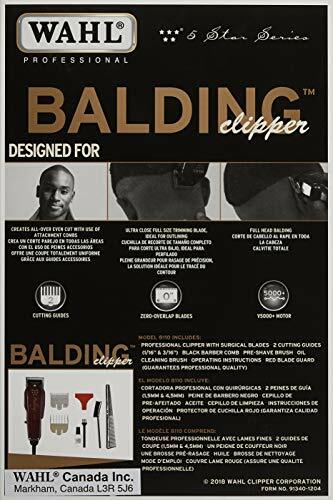 It’s another 5-Star hair clipper name from Wahl, but hey, at least they took the word “Balding” out of this offering. This version offers a bump-free, ultra-close shave for even the most sensitive of skin thanks to the patented “gold foil” on top that is hypoallergenic. Not sure exactly what makes a golf foil so impressive, but it must be good because the Andis Profoil has upped the game with a titanium foil. 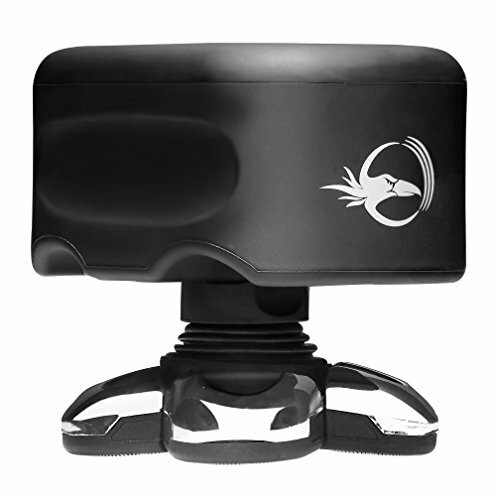 Like most of Wahl’s products, which are sold to commercial barber shops but are made available to individuals as well, it comes with a complete package full of accessories including a travel case, foil guard, wall charger, and more. Well for starters, no one is going to accuse you of mixing up their electric shaver for yours, unless there’s is also hot pink. It’s an odd choice for the manly man sector, but hey, to each their own. 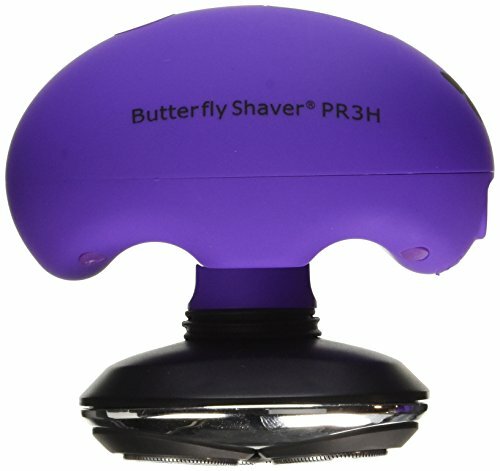 This shaver is designed to reach all areas of the body and resembles the Bald Eagle in terms of how it works. It has five separate rotating heads to get the job done quickly, and a large swirling shaver head to get them covering as much territory as possible in the shortest amount of time. Take note this is a wet or dry shaver, but absolutely should not be used in the tub or in the shower. It can go up to 90 minutes on a single charge but needs a good 2-1/2 hours recovery time. Finally, a shaver name I can get on board with. Braun’s not just a manly word, it’s the name of one of my favorite Transformers from the 1980s TV cartoon. The fact that he was killed by ONE SHOT from Starscream in Transfomers: The Movie still irks me to this day, 31 years later. 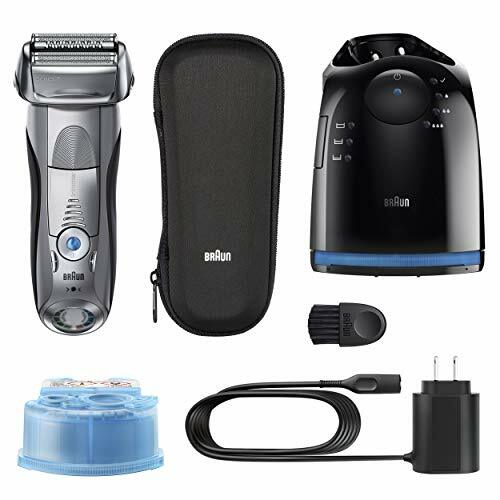 Much like the TurnRaise product listed above, the Braun Series 7 790 has built-in sonic technology which can automatically increase the power level on denser hair or in difficult areas. The 2X OptiFoil can cut your hair as close at 0.05mm and it comes with a 5-action, alcohol-based Clean and Charge station which cleans, charges, and lubricates the unit neatly and efficiently. Coming in at 2.7 pounds, it’s on the heavy side of th products we’ve reviewed, but it’s got a great rating of 4.4 stars out of 5 on Amazon, with 71% of those reviewers giving it five stars. The obvious answer is: Very carefully! When you’re using an electric head shaver, you do have a bit more leeway than if you’re using a safety razor, a straight razor, or a giant knife like my boy Pedro Cerrano in Major League. Here are a few smart tips to always remember. Just like any other shave, you want to shower beforehand to loosen up those follicles. Make sure you’ve got a comfortable grip on the shaver and if possible invest in an extendable shaving mirror to give yourself lots of maneuverability. Remember to try and only go over every area one time to keep it from getting irritated. It’s also important to remember that no gels or lotions are needed before shaving, the shaver does its best work with nothing to get in the way. Set a routine of days, times, and orders to shave to. This will get your hands and arms more into a comfort level and allow you make the same great shave every time. 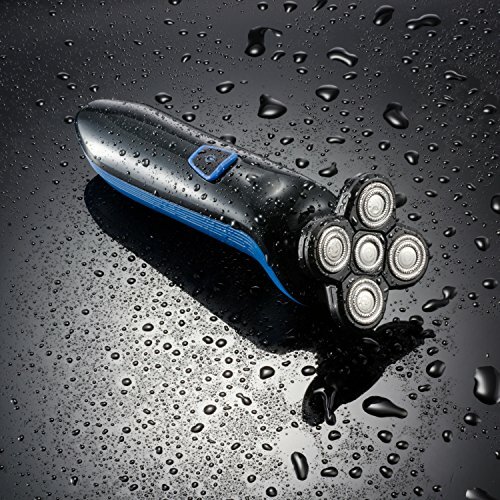 Religiously clean your shaver to keep its blades sharp and long-lasting. Have a razor that you swear by that you think we missed out on? Drop us a line or leave us to comment. Otherwise, until next time, Full Beard Ahead.